‘Buildings that Fill My Eye: the Architectural Heritage of Yemen’, an exhibition of photographs originally hosted by SOAS and curated by Trevor Marchand, Emeritus Professor of Social Anthropology (SOAS), recently returned to the UK after its journey to the Museum of Oriental Art in Turin and the Pergamon Museum in Berlin. The MBI Al Jaber Foundation, main sponsor of the original exhibition, alongside Gingko Publishing, the British-Yemeni Society and the London Middle East Institute, funded its latest move to the Department of Archaeology at King’s Manor, University of York. Sheikh Mohamed Bin Issa Al Jaber, Founder, Chairperson and sole funder of the MBI Al Jaber Foundation, who wrote the foreword to the exhibition’s catalogue, has a long-standing commitment to both Yemen and its people. The aims of this ‘travelling’ exhibition are to share the splendours of Yemen’s architectural heritage and to raise awareness of its cultural and historical importance. This heritage is threatened by a civil war that has continued since 2015 and, in addition to the humanitarian crisis and loss of life, key archaeological sites, museums and historic buildings have been damaged or obliterated. Dr Colleen Morgan, Lecturer in Digital Archaeology and Heritage, and Co-Director of Studies for Digital Heritage and Archaeological Information Systems at the University of York, introduced the event; Marylyn Whaymand, Head of Programmes at the MBI Al Jaber Foundation, gave a short presentation of its work and connections with Yemen, and Professor Trevor Marchand, who spoke at the exhibitions in Venice and Berlin, presented the opening lecture. 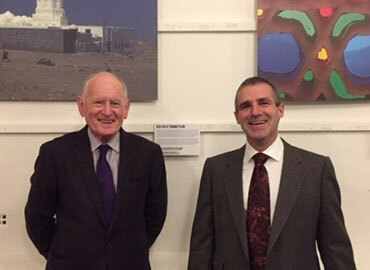 An enthusiastic audience of over 120 people including members of the Yorkshire Philosophical Society, lecturers from the University of York, the Chair of the British-Yemeni Society and the parents of ex-UK ambassador to Yemen, Nicolas Hopton, attended the event. The MBI Al Jaber Foundation would like to thank both Dr. Morgan and Professor Marchand for making this event possible and for continuing the life of the exhibition.